This course introduces the terminology and techniques of the analog recording studio from an artistic and operational point of view. Emphasis is placed on audio consoles, microphones, multi-track recorders, and echo chambers. Upon completion, students should be able to demonstrate understanding of operation and function of recording equipment and its relationship to musician, sound engineer, and producer. 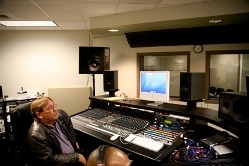 This course continues the study and application of recording techniques begun in Recording Engineering 1. 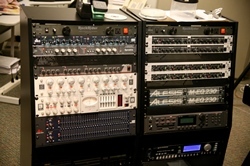 Emphasis is placed on analog multitrack recording and mixdown, microphone placement, and patch bay function as it relates to the live session recording. Upon completion, students should be able to create projects demonstrating proficiency in the skills and use of the equipment studied. This course introduces students to digital workstations in the recording studio. Using ProTools M-Audio, Nuendo, and Wavelab students will input audio into the computer and edit, mix and complete an audio CD recording. 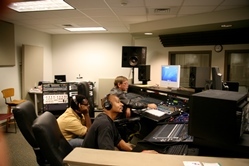 Audio Engineering 1 is a Corporate and Continuing Education class. At the top of the main CPCC webpage there’s a link to Corporate and Continuing Education. Click on that. At the bottom of the next page is a register now button. Follow that. 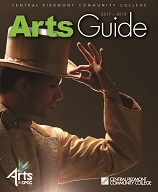 Follow the link to ‘Search and Register for Continuing Education Classes’. In the course prefix box type AAC-8002. Select which class you want and press the submit button.